What is a militia, why did Sark have a militia and when did it start? A militia is a group of ordinary citizens obliged to enroll for military instruction, practice and in the case of an emergency active duty. 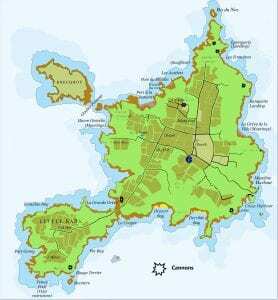 The history of Sark’s militia begins in 1565 with its first Seigneur, Helier de Carteret. 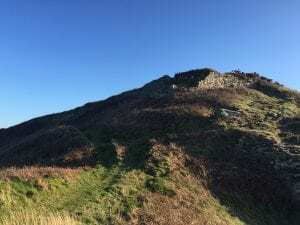 When Queen Elizabeth I of England granted him the fief of Sark, it was conditional upon him swearing loyalty to the English Crown and protecting the island against foreign invaders. To meet the obligation, Helier set up the Quarantaine of his forty sub-tenants; they had to swear allegiance to the English Crown and to maintain a musket for defence of the island. This was the beginning of Sark’s militia. In the event of invasion each of ‘the forty’ could – in theory – be called on to defend the coastline of his landholding. The Seigneur was head of the militia but, as Sark is part of the Bailiwick of Guernsey, Sark’s defences were subject to command of Guernsey’s Governor. Throughout history there have been threats of French invasion. The Channel is an important trading route and Sark is conveniently positioned between Jersey and Guernsey. The islands were anciently part of the Duchy of Normandy and only became allied to the English Crown when William the Conqueror, Duke of Normandy, became King of England in 1066. When King John lost Normandy in 1204, the Channel Islanders remained loyal to the English Crown, but French claims to possession rumbled on for centuries of wars and piracy. In the hostilities between Protestant England and Catholic France, Helier de Carteret’s Presbyterian Sark became a refuge for French Huguenots. Shortly before Helier’s colony, French military had briefly occupied and fortified Sark (1549 to 1553). They built three ‘star forts’ and a promontory fort along the spine of L’Eperquerie. After the French garrison had fled, Guernseymen destroyed the star forts but the wall and square bastion above L’Eperquerie Landing remain – and can still be seen. These defensive walls and gateway above the landing place at L’Eperquerie were repaired from time to time over the next three centuries, whenever there was danger of French invasion. The beach is easily reached from France and the ’12-foot road’ engineered by the French soldiers makes for an easy climb up onto the plateau of the island. The road zig-zags up through a great archway in the defensive wall which was once fitted with massive wooden gates to close off access to the island. The south-facing bay at Le Creux provided an anchorage closer to Jersey and St Ouen’s – the home of Sark’s De Carteret seigneurs. But there was no road to Creux until Helier’s son Philippe blasted a tunnel through the rock, to give fishermen access to the beach. The tunnel arch has a date stone 1588, Armada year, and you can still see traces of the iron hinges for hanging a defensive gate. Creux Harbour became easily defensible in time of trouble and a new road up Harbour Hill became Sark’s main access route. The outbreak of civil war in England in 1642 divided the Channel Islands. Sark’s royalist Seigneur joined his uncle, Sir George De Carteret, leader of the Royalists in Jersey. But Guernsey favoured the parliamentarians, confiscated Sark’s revenues from the seigneur and installed a military captain. Parliamentarian militia men were billeted on Sark families. Despite an attempt by Jersey to recapture Sark from Guernsey, the fief of Sark was not returned to the royalist Seigneur until 1660, when Charles II was restored to the English Crown. The restored Seigneur got plans and permission from the King to build a new harbour at L’Eperquerie and a map of 1680 shows the existing ‘old wall’ running along the L’Eperquerie, with the square bastion at the end. This wall and square fortification are still visible. 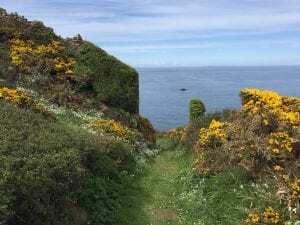 (1820-1830) remain in position today on Sark headlands. Some bear the stamp of the Crown and initials of the King or Regent; arrows stamped into the metal and serial numbers from the makers indicating the weight are still legible. Two other, shorter cannon, salvaged from the 1780 wreck of the East India Company Valentine, were reckoned to be serviceable. 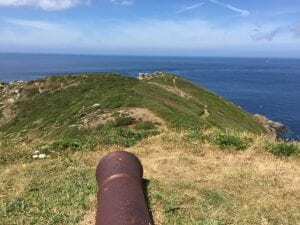 The cannons were positioned on the headlands and the old Sark Granary was leased as an Arsenal (next door to the Prison) for storing powder and small arms and uniforms. The French Revolution and ensuing Napoleonic Wars posed a huge threat to the Channel Islands and the militia had to be especially vigilant. The Seigneur of Sark as Colonel of the regiment was required to maintain the armoury, and night watches were kept at guardhouses (the remains of one still stands above L’Eperquerie landing). 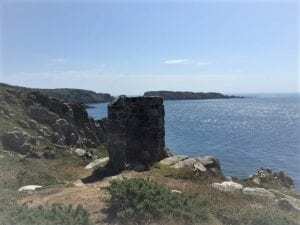 A signal tower for communication with Guernsey was built at La Seigneurie and survives intact. Chief Pleas fined any member of the militia who failed to carry out his duty. After the defeat of Napoleon at Waterloo, Sark militia was re-equipped with second-hand Brown Bess muskets from the British army. In 1831 Sark Militia, along with those of the other islands, was made Royal. The North and South Companies, about 100 men in all, met on L’Eperquerie for drills and target practice. Hand-me-down rifles (‘53s’) left over from the Crimean campaign in 1853 replaced Sark’s old muzzle-loaders, making shooting much more accurate. Seigneur W.T.Collings (1853-1882) was an enthusiastic Lieutenant Colonel and introduced target shooting competitions, sponsored by the British Government. Targets were placed on a stone wall at the north end of L’Eperquerie and the scores reckoned up by an artillery sergeant, who sheltered behind the granite half-round tower (known as a ‘mantlet’ – the only one in the CI) and signalled to the riflemen with a huge red flag.. The men shot from 200, 400 and 600 yards, and were awarded cash prizes for the winning scores. The Royal Sark Militia disbanded sometime around 1875 but continued to be listed by the War Office until 1900. The militia uniform changed over time from red with yellow facings to red with blue facings and silver lace, and then red laced with gold. There is a fine painting by Arthur Bradury that famously shows Dame Sibyl Hathaway’s daughter Jehanne Beaumont wearing such a scarlet and gold uniform. The best and most interesting place to start is at L’Eperquerie where remnants of the fortifications can prompt you to imagine what this part of the island looked like in the days of the militia. 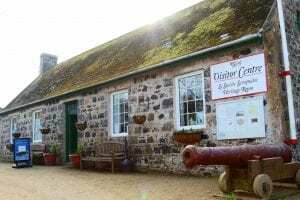 There are surviving artefacts such as uniform and artillery at La Seigneurie. The uniforms are held inside the house and a tour of the house by our current Seigneur may be arranged in advance, subject to availability. 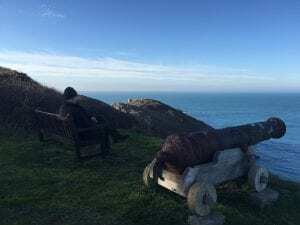 The artillery, including the bronze cannon shipped to Helier de Carteret by Queen Elizabeth I from the Tower of London in 1572 can be viewed in the grounds. A scattering of cannons on various headlands still point out to sea in their original sites, some of them mounted on modern oak gun carriages. The map below shows the locations of various military issued cannons. The cannon outside the Visitor Centre was recovered from The Valentine. Although originally a merchant cannon it was, for a while, counted as serviceable in the armoury of Sark’s militia. In compiling this information, special acknowledgement needs to be given to the British & Commonwealth Facebook pages and to Richard Axton, whose article ‘The military on the Eperquerie’ was printed in Sark Life, 2013. More information on the Militia and Sark’s history in general can be discovered at La Société Sercquaise, located next door to the Visitor Centre.